“Broadcasters may say ‘cheers!’ to the support the industry is receiving in its effort to keep in place the consent decrees governing how ASCAP and BMI rates are set. More than 1,100 bars, restaurants, wineries and hotels have signed on to a letter to the Department of Justice urging that the decades-old agreements be left intact. Read the rest of this InsideRadio story, covering a MIC Coalition big tent letter, here. 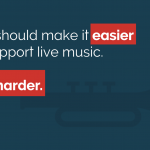 VENUES ACROSS AMERICA SUPPORT LOCAL MUSICIANS!